Embracing the aspiration infused into the original 1989 MX-5 Miata, the 2019 Mazda MX-5 Miata 30th Anniversary represents and celebrates three decades of the MX-5’s legendary history. Boasting superior craftsmanship and innovative design, the 2019 Mazda MX-5 Miata 30th Anniversary stays true to Mazda’s commitment to engineering cars that deliver pure driving joy. Use the interactive photo below to discover and explore some of the new features in the 2019 MX-5 Miata 30th Anniversary. RAYS 17-inch Dark Gunmetal forged alloy wheels play up the MX-5’s driving legacy. The strikingly vivid and first-ever Racing Orange exterior paint color represents sunrise and anticipation. Brembo front brakes with Racing Orange-painted front and rear calipers. Mazda’s legendary SKYACTIV-MT six-speed manual transmission includes a limited-slip differential. Bilstein dampers and front shock tower bar cater to driving enthusiasts by delivering an aggressive and authentic race car experience. Racing Orange door inserts and lower instrument panel extend the color theme to the car’s interior. 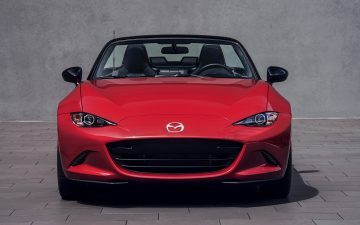 Standard in all 2019 Mazda MX-5 30th Anniversary models is Apple CarPlayTM and Android AutoTM.